The following tour description is from my guidebook Washington Byways. The 56-route guide details non-technical backcountry roads for adventure motorcyclists and SUV-borne travelers. The book is available as a convenient PDF download ... for just USD$14! To get your copy, contact us at: backcountrybyways at gmail dot com. It's a 25mb-plus file, so you will need either Dropbox or Google Drive -- both free to download -- to transfer it. HIGHLIGHTS With its wildflowers and views of the Olympic Mountains, particularly glacier-capped 7,965-foot Mt. Olympus and the park’s deep river valleys, this short, narrow and winding ridgeline road packs a powerful scenic punch as it climbs to 6,150 feet. It runs both just below and on top of Hurricane Ridge (named for the winds that blow in winter), and ends above tree line at the base of 6,450-foot Obstruction Peak. 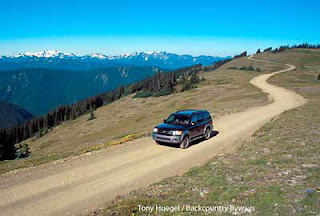 The parking area at the end of the road is the trailhead for a number of day hikes, including the steep, 7.6-mile (one way) Grand Ridge Trail to Deer Park (Tour 3 in Washington Byways). DIFFICULTY Easy, on a good high-clearance, native-surface road. The park tries to have the road open by July 4, depending on weather and the previous winter’s snowpack. It is generally closed to overnight parking in early October. It is closed altogether by the end of October. It is also closed whenever snow, which can occur anytime, makes driving hazardous. This is a busy road on sunny summer weekends, and the parking area at the end fills up fast. So consider going on a weekday if you can, or going early in the day. TIME & DISTANCE 1 hour; 15.6 miles round-trip. But this is a great day-hiking and sightseeing destination, so plan on spending considerably more time. MAPS The map you’ll receive upon entering the park (and paying the $10 fee) is adequate. It is also shown in Benchmark Maps' Washington Road & Recreation Atlas, p. 54 (E-G, 3-4). GETTING THERE From Port Angeles, take South Race Street southeast to Mt. Angeles Road, which will take you to Heart O’ the Hills Road and the park entrance ($10). Follow Heart O’ the Hills Road to Hurricane Ridge Visitor Center. Just before you reach the visitor center, look for a small sign for Obstruction Point Road, on the left. It’s easy to miss. Set your odometer to 0. REST STOPS Heart O’ the Hills Campground, near the park entrance. Hurricane Ridge Visitor Center and picnic area. THE DRIVE The little road, a mere shelf at first on the south-facing wall of Hurricane Ridge, immediately drops below the ridge. On your right is the plunging canyon of the Lillian River. The road takes you through a bit of sub-alpine forest at first, then crosses the ridge. In just a mile and a half or so you will have some of the country’s most impressive coastal mountains spread out before you, with their shimmering glaciers, snowfields and steep-walled river valleys. For safety, stop to take in the view, and be aware of other vehicles. Soon the road brings you to the top of the ridge, where you will meander through sky-scraping meadows splashed with wildflowers. In short order, unfortunately, you will reach road’s end. If there’s room to park, you can savor a sweeping vista that reaches from Mt. Olympus’ glaciers to ships plying the waters of the Strait of Juan de Fuca, less than 20 miles to the north. Adrian, thank you for your interest. I may be able to help. Just send me a note at backcountrybyways at g mail dot com. It's available as a PDF download, which you can print or carry along on your laptop, tablet or e-device.